In 2010, Gerald Crawford hit "rock bottom." He was a methamphetamine addict living on the street with only two duffel bags of clothing to his name. He was featured in a Dec. 2010 news story in City Weekly about the funding-strapped Drug Offender Reform Act (DORA). At that time, Crawford, sober for three months, was sleeping at a shelter plagued with drug use. From there, he began the slow, shaky climb to a new life. He found work with AAA as a roadside service technician, he says, only to suffer a three-month relapse after hanging out with old friends. Crawford regained his sobriety and, in 2013, found work at a downtown fast-food franchise where the 33-year-old is currently a manager earning $10 an hour. In 2014, he set himself several goals to become "more self-sufficient and more employable." He reached a deal with the IRS over unpaid back taxes and, after studying at Horizonte Instruction & Training Center, got his high school diploma. One goal, however, remains out of reach. Crawford has had several job interviews for higher-paying positions with benefits, only to be told his criminal record barred him from employment. "That was who I was then, it's not who I am now," he says. Crawford went to the Bureau of Criminal Identification (BCI) and applied for his record to be expunged. Crimes such as murder and first-degree felonies can't be expunged. A clerk informed him that his six class B misdemeanor convictions—mostly drug-related—exceeded the statute-imposed number permitted for expungement. Crawford believed he was stuck with his criminal record for life. But maybe not. Rep. Eric Hutchings, R-Kearns, says that legislation he sponsored in 2012 and 2013 means that Crawford and those wanting to clean up their records may have other routes to expungement. The BCI is, as he describes it, "a vending machine of expungements," costing $50 for the application and $56 for an expungement certificate for each conviction. But in 2012, a legislative working group determined that the Utah Board of Pardons & Parole could provide an alternative route to expungement after an individual has been denied by the BCI, through applying for a pardon of criminal convictions. Applicants generally need a five-year stretch without any contact with the criminal justice system. Unfortunately, word about a second chance through the Utah Board of Pardons & Parole has failed to get out to those most in need of a clean slate. "I honestly don't think people know," Hutchings says of the process of getting criminal records expunged in Utah. Mary Jo McMillen, executive director of nonprofit Utah Support Advocates for Recovery Awareness, was part of the 2012 work group that led to the alternative route of pardon and expungement through the Board of Pardons & Parole. "I think we still have a great deal of challenges," she says of the BCI expungement process, which can be off-putting in its complexity. "Unless you're an attorney, walking through the process, you have to be tenacious." It's also expensive. There is grant money for single mothers with dependent children to get their records expunged; otherwise, there are "no additional funding sources," McMillen says. BCI director Alice Moffat says her agency does a "review of the complete criminal history" of an individual to determine if he or she is eligible for expungement. If they are, they then take an expungement document to court to have a prosecutor and a judge sign off on it. If the BCI finds that an individual is not eligible for expungement, he or she can appeal within 30 days to the BCI. If the person is again denied, they can appeal to a judge in 3rd District Court. In 2013 and 2014, approximately 5,500 people applied to the BCI each year to have misdemeanors or felonies expunged. Around 4,450 applicants were approved each year "for at least one eligibility certificate," according to a BCI official, with more than 1,110 each year denied. In 2013, 387 people appealed the denial, while only 212 did so in 2014. McMillen is concerned that the BCI is not a cheerleader for expungement by the Board of Pardons & Parole. "I don't think they are clear enough about 'Here's your other option.'" While the BCI, Moffat says, does not provide legal advice, "We do let them know there is this one additional option," namely the Board of Pardons & Parole. But if the BCI does not inform an applicant that expungement can be achieved through applying for a pardon, as was the case for Crawford, finding that out independently isn't easy. On the BCI website, it's buried at the bottom of a two-page explanation of the "criteria for a certificate of eligibility." 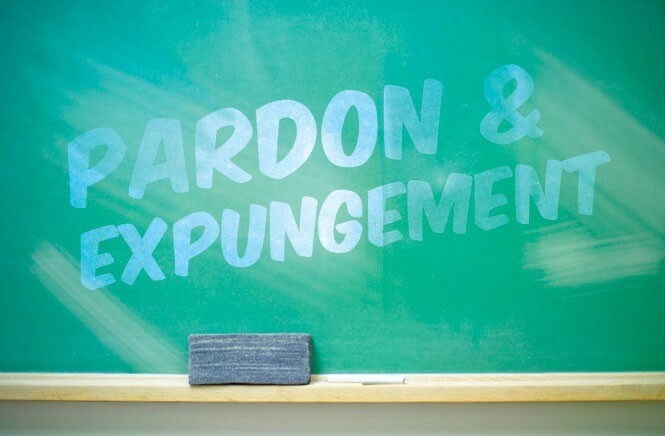 Furthermore, on the Board of Pardons & Parole's website, there is no mention of the word "expungement" until you get into the nitty-gritty of instructions. Applications for a pardon has grown significantly in recent years, says board spokesman Greg Johnson. From 15 in 2012, the number of people applying for a pardon in 2013 climbed to 43, 18 of whom were granted. The following year, 53 applied, of whom 34 received a pardon. It typically takes three months for the board's pardon specialist to investigate an applicant's background and decide whether or not to grant a hearing before the five-member board. The board has more latitude than the BCI. "It can look at the whole history of a person—their sobriety, employment, family situations that have improved," Johnson says. The BCI, by comparison "doesn't consider any of that. It's a check box; you either meet its criteria or not." The Board of Pardons & Parole, Johnson says, has reached out to the BCI and indigent legal defenders to spread the word about its pardon process. "We do want to be a service for everyone that can benefit from it," Johnson says. While he acknowledges "some success" with people being referred to the board by the BCI, he hopes that the communication process will improve. People seek pardons for various reasons, Johnson says: because they are applying for a job, have put their life back together, as a final step to help them move forward, or in some cases because they are at the end of their life and want to resolve their affairs. "It can be frustrating for ordinary folks with a couple of small offenses who are not familiar with how the system works when they don't know where to go," Johnson says. Crawford said he called the Board of Pardons & Parole about expungement, but an employee there directed him to the BCI. In an e-mail, Johnson said it sounded like "miscommunication. If BCI told him he was ineligible to expunge a conviction(s), then applying for a pardon would be his next step." "I want to turn around, find me a full-time career, make good money, retire, and live the American Dream," Crawford says. At his current job, after rent, utilities and basic costs, he has nothing left to save. He cites more than a half-dozen friends, who, like him, are held back by drug-offense-related misdemeanor histories that they cannot erase. As Crawford stands up to go back to the serving counter at the fast-food restaurant, he says with his back taxes resolved and gaining his high school diploma, "I'm on a roll right now." This, he says, pointing to the BCI denial, "is the only thing that's holding me back. It's my last hurdle."